When holding these two screens, you can feel that the iPhone 6S Plus LCD screen and digitizer with frame is obviously heavier than the iPhone 6+. At first glance, though, we don’t see any obvious differences between the two earpiece holes, front camera holes, sensor holes or home button holes, as well as the touch response sizes. However, you can see that the flex ribbons are in different shapes. 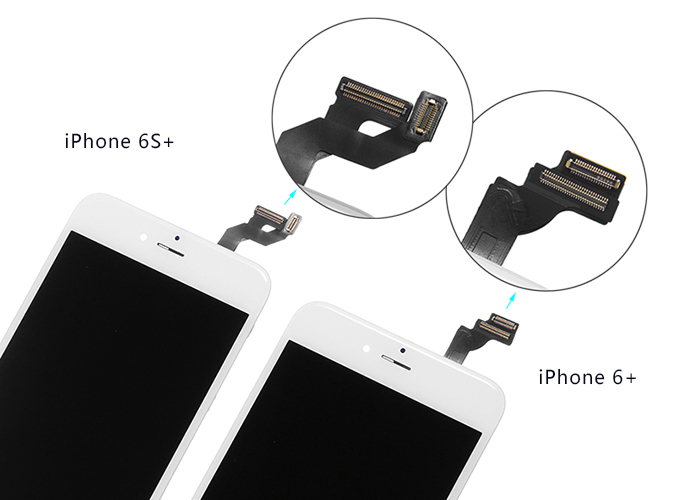 After careful observation, we found that one of the two iPhone 6S+ LCD assembly flex ribbons is for connecting the home button and logic board, while the other is a flex unit for both the LCD display and touchscreen. 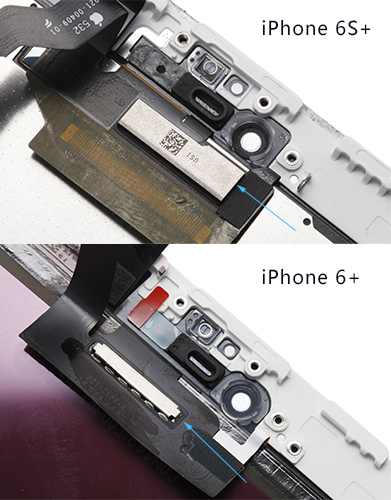 However, the two flex ribbons on the iPhone 6+ LCD assembly have individual flexes for the LCD display and touchscreen. Checking further, it’s quite plain to see that the ICs on the flex ribbons of these two devices are completely different. 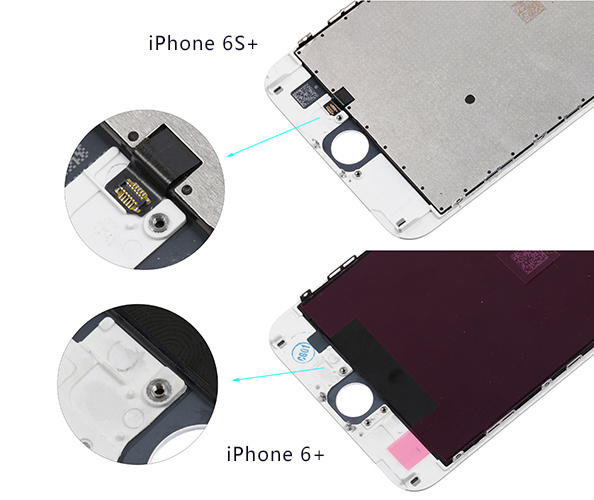 That’s to say, the LCD screen and digitizer assemblies for iPhone 6S+ and iPhone 6+ are not interchangeable with each other. As for the outer glass layer, we haven’t tested them yet, but there is a fair chance that the iPhone 6S+ glass lens works on the iPhone 6+. Like the previous iPhone 5/5C/5S, it’s a fact proven by many repair shops that the glass screen is compatible while the other screen layers are not. 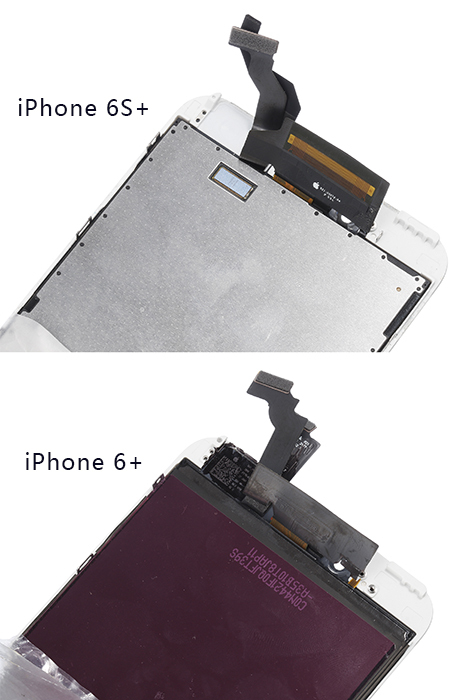 What about the digitizer frame? 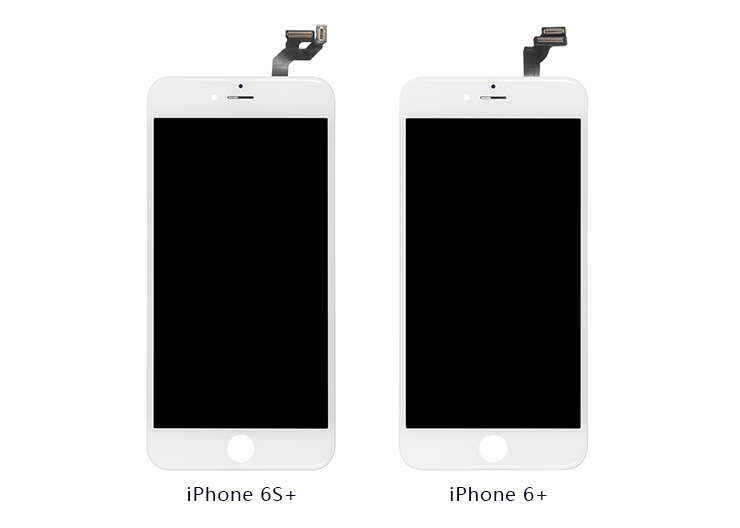 Apparently, the iPhone 6S+ digitizer frame does not looks the same as the iPhone 6+’s. 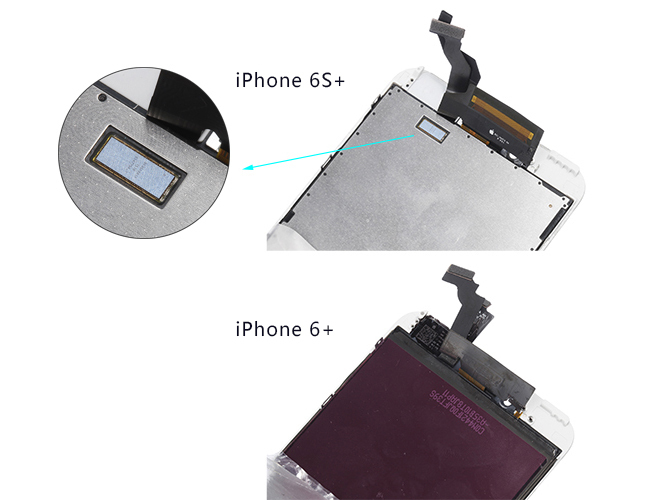 In other words, the iPhone 6+ digitizer frame is not compatible with the iPhone 6S+. Before looking deeper, we theorized that the plastic retaining brackets for the front-facing cameras were the same, however, that turned out to be wrong. There’s a little difference hiding under the flex ribbons. As for the earpiece mesh cover with gaskets, they look exactly the same. Another big difference is the IC chip for the 3D Touch in the iPhone 6S Plus as you can see on the above picture. 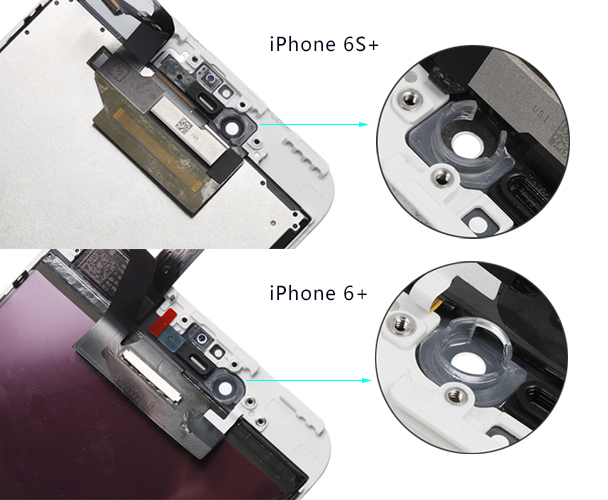 We’ll update the results once we make sure that the iPhone 6S+ and iPhone 6+ glasses are interchangeable. If anyone has any luck using an iPhone 6+ glass replacement on an iPhone 6S+, please let us know your feedback by commenting below. *Updates: the iPhone 6S+ and iPhone 6+ glass lens are NOT interchangeable as the radians of edges are different, which will obviously be seen once the glass len was applied with a tempered glass screen protector, we'll make a report soon. Tips For iPhone 6s 6s Plus Screen Replacement?